Everything you need to service ball joints on most 2WD and 4WD vehicles. 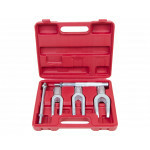 This ball joint service kit includes a C-frame press along with installation and removal adapters. The parts in this ball joint kit are drop forged and treated with black oxide to resist rust and corrosion for added durability. 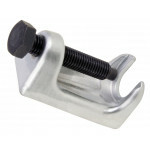 Three receiving tubes sizes: 2-3/4" x 3", 2-1/4" x 2-1/2", 1-3/4" x 2"
Always apply oil on the threads of the bolt before use, oil will reduce resistance and will increase the lifetime of the tool. Due to the heavy weight of the tool components the PVC case may have damaged that can be caused in shipping. 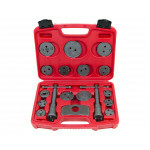 The universal wind back tool set of adapters are suitable for a wide range of vehicles and applicati.. 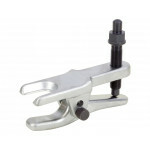 The universal ball joint separator is designed to separate the ball joint from the spindle support a..